My first Sunday Salon...and I am not allowed to be a member/participant because they are full. This makes me sad, but I am going to do it anyway without being officially affiliated with links, etc. It's been quite a week and I am certainly enjoying my 4-day weekend. Thank you Abe and George (that's Presidents Lincoln and Washington just in case you weren't sure). Thursday I attended my dad's retirement party after 44 years as a professor at the University of California, Santa Barbara! We moved here when I was just 6 weeks old so the reception was really fun because lots of his old graduate students attended in addition to other folks that I have known most of my life. The University has even started an endowment in his name; pretty cool! Friday, started out not quite so fun. I had to get my first crown at the dentist (cracked tooth). Novicane is just weird. The day definitely got better though as my daughter and I made a shirt while I get the feeling back in my tongue and lips. Bear in mind that we are NOT expert sewers. We had left over fabric, ribbon, and no pattern. We made tons of mistakes, but I think it's kinda' cute on her. To top off the day, the Winter Olympics started! I am such a HUGE fan of the Olympics, both Summer and Winter. We watched the opening ceremony on Tivo so we could fast forward through the ads. I just get so choked up watching the parade of athletes: countries with only a few athletes; Iran having a woman carry their flag; Georgia mourning the loss of their athlete; and all the other personal stories. I must confess that I do wish the American media could stop talking about how many medals everyone has won and just appreciate the efforts of the athletes. 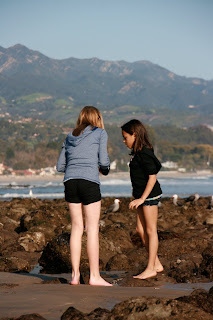 Saturday saw a beautiful day in Santa Barbara so we went tide-pooling at the beach. Today my daughter and I are going down to Los Angeles to see the Harlem Globetrotters! Do you remember them? I saw them perform when I was in high school and had kind of forgotten about them. Then, on the latest season of the Amazing Race (which begins again tonight, I might add) had a pair of Harlem Globtrotters on it so we got tickets. Are you a reality show addict? If so, which ones? How awesome 44 years as a professor, and living in such a lovely area all of your life --lucky you. That top looks so great on your daughter and she looks pretty proud about it too! Congrats on your first "unofficial" official Sunday Salon! I had no idea that there was a cutoff number. But the purpose of the Sunday posts is to have all of us bloggers chatting away and whether or not you are an official "member" doesn't matter to me! I just love the fact you're sharing your week with all your book loving friends! Loved the shirt! Very cute! And your daughter is cute too! Enjoy your week! Wish I could go tide-pooling! We're just getting rid of SNOW! Yuk! I'm not sure why they closed Sunday Salon for new participants. I apparently got in just under the cut. I am also obsessed with The Olympics. We have a fun and exciting two weeks ahead of us! Hmmm. Didn't realize Sunday Salon was limited. In regards to reality TV, I am a junkie. I love watching Bad Girls Club and all of those dating shows on VH1. I don't have VH1 as a channel anymore and am having serious withdrawal! Diane, Sophia was very proud of her new shirt. We even saw one quite like it in GAP yesterday! Katy, Globetrotters are definitely cooler as a kid than an adult, but I enjoyed watching Sophia laugh at them and their antics! Michelle, I spend a great deal of time choked up while I watch the Olympics. I just love the personal stories. Mummazappa, thanks for the award! April, I've never heard of the VH1 reality shows. That shows my age, I guess. I like So You Think You Can Dance and Amazing Race. Eva, thanks for the props on the shirt!